The deservedly famous, delicious favorite The Grit has held the vegetarian restaurant crown in Athens for many years, but I doubt any diners (or anyone at The Grit) is sorry to see another addition to the vegetarian dining options in town. The locavore movement (which prioritizes eating food grown nearby) has made an impact in Athens, and new restaurant Gymnopedie embraces both with their "natural, vegetarian, local" mantra. Gymnopedie, located in the Leathers Building on Pulaski Street near downtown, opened in late August, to praise from the foodie community. Seating just 16 people in their intimate dining space, Gymnopedie is the brainchild of Sarah Dunning, the self-taught head chef, with support from her husband Cal Clements, who serves as maitre d&apos;. 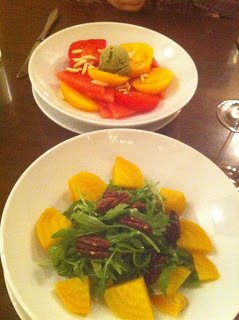 Dunning&apos;s approach to food is simple and healthy: she cooks with a minimum of fat, almost no dairy, and avoids food which are common allergens, focusing on very fresh vegetables and whimsical presentations, like in an heirloom tomato and watermelon salad we tried on our visit, which was served with mint sorbet (top plate). The menu features a handful of dishes, rotated regularly, and displayed on a chalkboard in the dining room. French wines make up the bulk of the drink menu, with cocktails like sangria (delicious) offered as ingredients are in season. The tucked-away restaurant embodies some of the best parts of Athens: it feels a little like a secret spot, but it also feels inclusive and warm. Longtime Athenian Clements is welcoming and helpful as a waiter, and the space features, on one wall, an intricately-pieced quilt that he made himself. A large painting by acclaimed Athens artist Terry Rowlett hangs on the other wall. 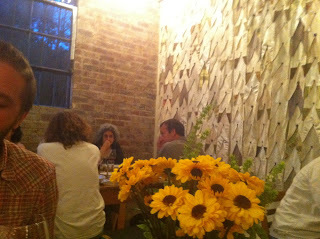 Reservations are highly encouraged at Gymnopedie, and can be made online via their web site. They&apos;re open Wednesday-Sunday 5:30-9:30 p.m. To get there, drive north on Pulaski from downtown, crossing Prince Avenue / Dougherty Street. The Leathers Building is on the left just before the railroad tracks. Park on the side of the building closest to the tracks (the north side).